Early bird registration still open until Apr 6th 2019! Abstract submission until Apr 30th 2019! Pioneered by the Nobel Prize winning works from Bertram N. Brockhouse and Clifford G. Shull, neutron scattering has become an indispensible technique for the microscopic probe of magnetic order and excitations in magnetic materials, strongly correlated electron systems and unconventional superconductors. This has in turn helped to drive the developments in information technology in the past decades. Unsurprisingly, magnetism research with neutrons also represents one of the most active research fields at MLZ. 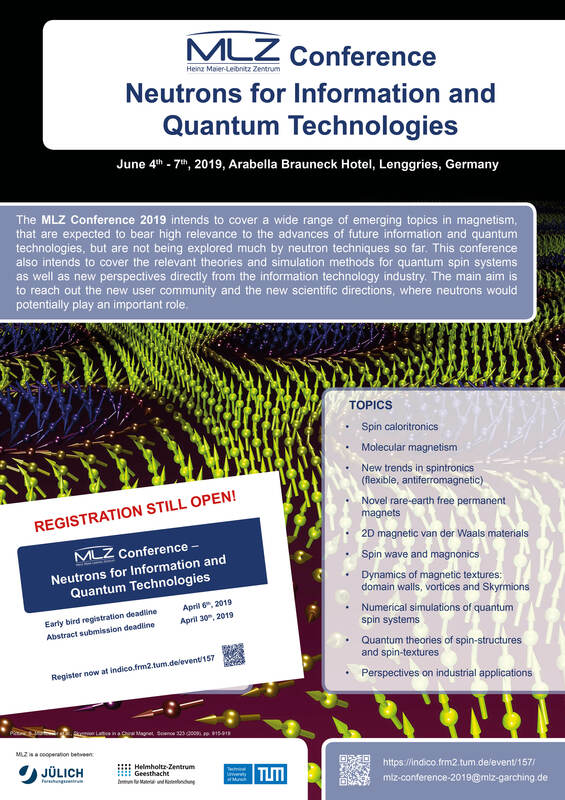 The MLZ Conference 2019 intends to cover a wide range of emerging topics in magnetism, that are expected to bear high relevance to the advances of future information and quantum technologies, but meanwhile, are not being explored much by neutron techniques so far. This conference also intends to cover the relevant theories and simulation methods for quantum spin systems as well as new perspectives directly from the information technology industry. The main aim is to reach out the new user community and the new scientific directions, where neutrons would potentially play an important role.